Last week I had the pleasure of being the guest speaker at the Region of York Quilters Guild in Newmarket. My quilts and I received a very warm welcome, and I may have convinced a few members to dig out their unfinished applique projects. Fingers crossed! Here are a few of my very early quilts that I showed. When I was 21 I took an 8 week class at a local quilt shop and made this sampler quilt. Hand applique was my favourite technique! When my kids were little, I made quilts to keep them warm, and to save my sanity. Speaking of the Region of York Quilters Guild, they have a quilt show coming up! Who doesn’t love a quilt show? The show is being held on April 6 and April 7 at the Newmarket Community Centre located at 200 Doug Duncan Drive in Newmarket, Ontario. Admission is $7. 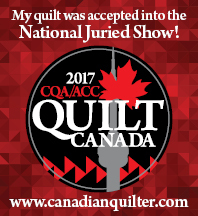 Hope to see some amazing quilts! If you would love to learn how to hand piece, this book is for you! It starts with very easy blocks or sections. Then you work your way up to curved piecing and such pointy points that all your quilting friends will think you are a superstar! This is the block I worked on last week. It’s called Castle Wall. First you add 4 squares to the octagon. Next you add a square to the white background piece. Then you add 2 diamonds to either side (good practice for setting in seams). I am starting to sew sections together. I must confess, I am loving it! So this next block consisted of curved piecing. Which is the same as straight line piecing, except it’s on a curve! Bruin acts like he doesn’t care, but he really is impressed! Can you spot the block? (Hint: it’s the only orange block). Good, clean fun! The Spring Applique Retreat is fast approaching. I have 2 spots left and I would love to fill them. Here are the details of the Retreat. This is the block that I will be teaching. The Hummingbird in Flight pattern is suitable for beginners, especially those wishing to learn Prepared Edge Applique. If you are interested in attending, please email me at burke.kerry@ymail.com.